Ivanka Trump shakes hands with people honored for their work to stop human trafficking including Allison Lee, of Taiwan, and Boom Mosby, of Thailand, right, during a 2017 Trafficking in Persons Report ceremony at the State Department, June 27, 2017, in Washington. Three videos from a mobile phone that described the beatings of an Indonesian crewman aboard a Taiwan-flagged vessel led Allison Lee to find her role as an advocate for those afflicted: migrant fishermen. Lee, the co-founder of the Yilan Migrant Fishermen Union, was recognized by the United States for safeguarding the rights of foreign fishermen working in Taiwan. In accepting her award in Washington on Tuesday, she made one appeal: to end slavery on the open sea. To know the path from ocean to consumers' dinner plates is to know the story of floating sweatshops, Lee told VOA on Tuesday. “Migrant fishermen are vulnerable to exploitation,” she said. Flanked by President Donald Trump's daughter Ivanka Trump and Secretary of State Rex Tillerson on Tuesday, Lee was one of the eight men and women to receive “Hero Acting to End Modern Slavery Award” at the State Department, where the 2017 Trafficking in Persons (TIP) Report was released. Allison Lee, the co-founder of the Yilan Migrant Fishermen Union, was recognized by the United States for safeguarding the rights of foreign fishermen working in Taiwan. Lee is the first Taiwan citizen to receive the honor. Migrant workers aboard Taiwan-flagged fishing vessels that operate in international waters are not covered by the so-called Labor Standards Act, the laws governing employer and employee rights. Therefore, they do not benefit from Taiwan's minimum-wage regulations regarding overtime pay, Lee said. In a tweet on Wednesday, Taiwan President Tsai Ing-wen reaffirmed her government's pledge to battle against human trafficking. “Taiwan is committed to working with all stakeholders to fight human trafficking,” Tsai tweeted. For eight consecutive years, Taiwan has been ranked in the “Tier 1” category, the best ranking in the human-trafficking report. While acknowledging Taiwan's “serious and sustained efforts,” Washington urged Taipei to increase efforts to prosecute and convict traffickers under the anti-trafficking law. 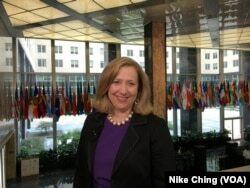 Susan Coppedge, the U.S. Ambassador-at-large to Monitor and Combat Trafficking in Persons. The TIP Report is a symbol of the U.S. moral and legal obligation to combat tragic human rights abuses and as well as to advance human dignity around the world, said Susan Coppedge, the U.S. Ambassador-at-large to Monitor and Combat Trafficking in Persons. “Tier 1 countries meet the minimum standards to combat trafficking, but that's just the minimum. 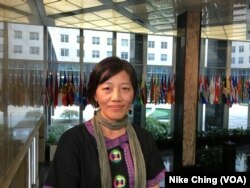 They don't rest on their laurels, so to speak,” Coppedge told VOA on Tuesday. “They need to continue their efforts to combat trafficking, and one of the areas where Taiwan can make additional progress is in labor trafficking,” she added. On January 15, 2017, the Act for Distant Water Fisheries took effect in Taiwan amid growing pressure on Taiwan's seafood industry to crack down on modern-day slavery and abuses for migrants working on the island's fishing vessels. Lee told reporters that being a Christian gave her strength to withstand the pressure from government officials and the industry.